We will show how to specify uncertain physical parameters and create uncertain state-space models from these parameters. You will see how to evaluate the effects of random and worst-case parameter variations using the functions usample and robstab. Figure 1: Two-cart and spring system. The two-cart and spring system is modeled by the block diagram shown below. Figure 2: Block diagram of two-cart and spring model. Uncertain continuous-time state-space model with 2 outputs, 2 inputs, 4 states. Type "F.NominalValue" to see the nominal value, "get(F)" to see all properties, and "F.Uncertainty" to interact with the uncertain elements. Figure 3: Uncertain model of a closed-loop system. We'll use the feedback function to compute the closed-loop transfer from r to y1. Uncertain continuous-time state-space model with 1 outputs, 1 inputs, 7 states. Type "L.NominalValue" to see the nominal value, "get(L)" to see all properties, and "L.Uncertainty" to interact with the uncertain elements. Type "T.NominalValue" to see the nominal value, "get(T)" to see all properties, and "T.Uncertainty" to interact with the uncertain elements. Note that since G1 and G2 are uncertain, both P and T are uncertain state-space models. Will the feedback loop remain stable for all possible values of k,m1,m2 in the specified uncertainty range? We can use the robstab function to answer this question rigorously. -- It can tolerate up to 288% of the modeled uncertainty. -- There is a destabilizing perturbation amounting to 289% of the modeled uncertainty. -- This perturbation causes an instability at the frequency 575 rad/seconds. 12% for k. Increasing k by 25% decreases the margin by 3%. 47% for m1. Increasing m1 by 25% decreases the margin by 11.8%. 47% for m2. Increasing m2 by 25% decreases the margin by 11.8%. The report indicates that the closed loop can tolerate up to three times as much variability in k,m1,m2 before going unstable. It also provides useful information about the sensitivity of stability to each parameter. The variable wcu contains the smallest destabilizing parameter variations (relative to the nominal values). Note that the peak gain across frequency of the closed-loop transfer T is indicative of the level of overshoot in the closed-loop step response. The closer this gain is to 1, the smaller the overshoot. We use wcgain to compute the worst-case gain PeakGain of T over the specified uncertainty range. Substitute the worst-case parameter variation wcu into T to compute the worst-case closed-loop transfer Twc. Finally, pick from random samples of the uncertain parameters and compare the corresponding closed-loop transfers with the worst-case transfer Twc. 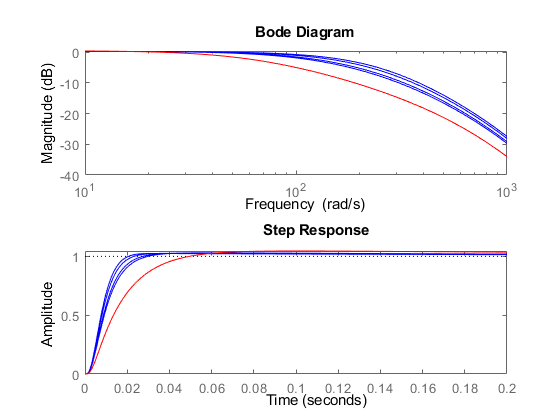 Figure 4: Bode diagram and step response. In this analysis, we see that the compensator C performs robustly for the specified uncertainty on k,m1,m2.